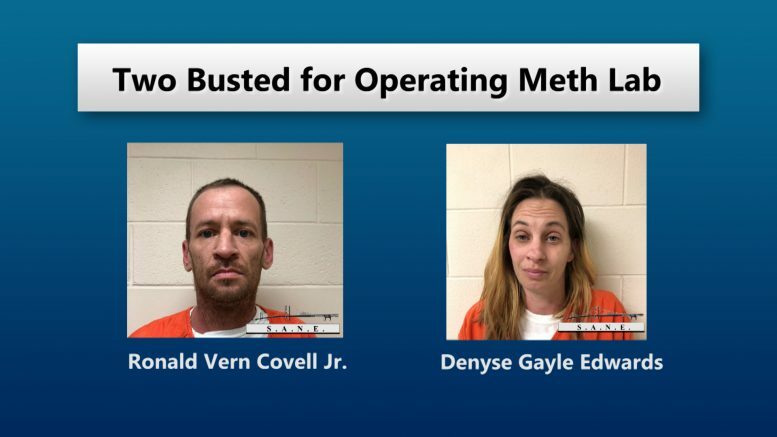 Tower, Mich. — Two people arrested for operating a meth lab out of their home. Now, they face substantial prison time. Straits Area Narcotics Enforcement received a tip in early February of a possible meth lab. They executed a search warrant and seized methamphetamine, equipment, chemicals, and other components to manufacture methamphetamine. Authorities arrested 41-year-old Ronald Vern Covell Jr. and 39-year-old Denyse Gayle Edwards of Tower. Both were charged with operating/maintaining a laboratory involving hazardous waste, operating a meth lab, and possession of methamphetamine. all three charges carry at least a penalty of 10 years in prison and over $15,000 in fines. The Presque Isle County Sheriff’s Office assisted in the arrest. This is the third meth lab seized by S.A.N.E. in 2019. Four More Arrested Following Meth Lab Bust In Long Rapids Twp.